9-30-06 Turtle Trax Diary Susan Shie. 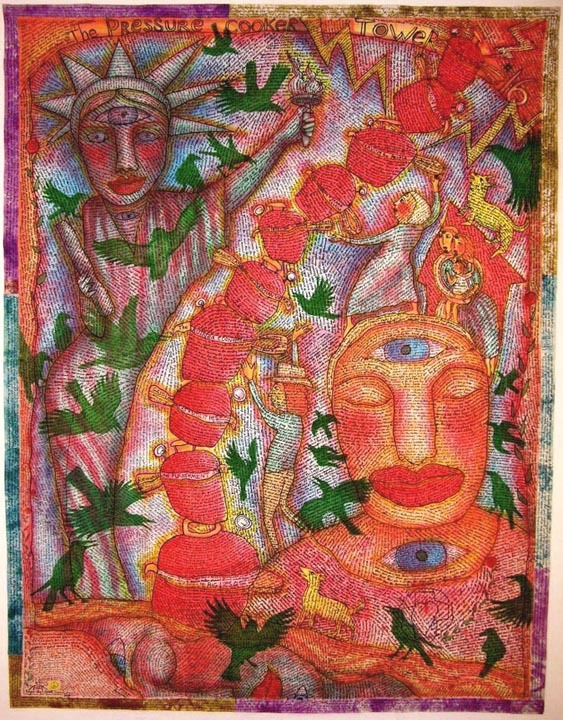 Outsider Art Quilts,paintings.fabric painting..Turtle Moon Studios. 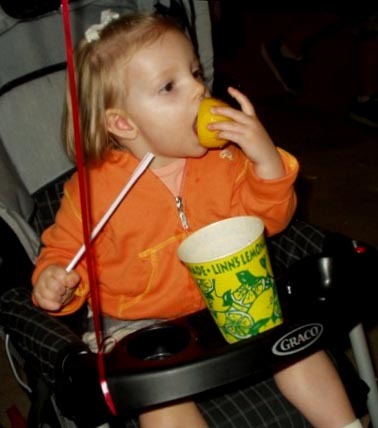 Here's Eva at the Wayne County Fair on September 9, really digging into her mommy's Lemon Shake-Up, using the lemon to scoop up the ice, since the lemonade is all gone. Because Eva is the famous Fruit Bat, she's also gnawing on the lemon. What a happy girl! Topics in this diary: Garden of Freedoms painting #6; Jimmy and Eva reading the Potty Book; Sweet Patooty and Hattie Healing; Gretchen and Eva out back; QSDS; The Power Out / Devil; Aimee's family's visit; Jimmy's flasks; The Pressure Cooker / Tower; The Fair; my Art Quilt Tahoe tee shirt drawing; YaYas in Niagra; the last three print quilts' center panels; a flask image, carved but not yet painted; Eva admires my birthday cake; my Libra Birthday Blessings drawing. 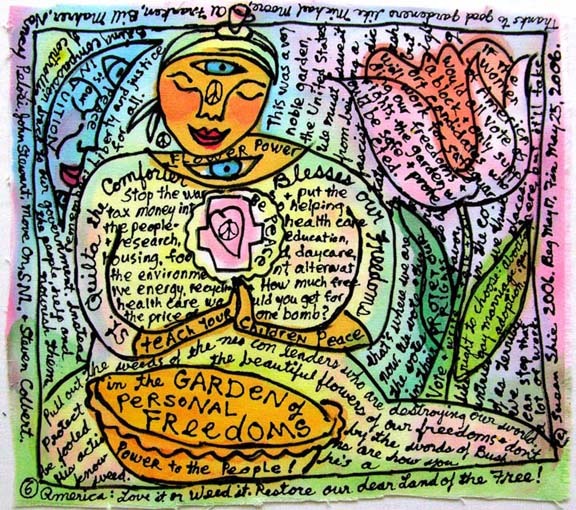 Above is "Garden of Freedoms #6," which is 10"h x 11"w, a painting on unstretched fabric, suitable for framing. Like all my work, it's for sale, at $220. for this piece, plus shipping. I have 2 more, similar paintings this size from this series, as well as one that's 16.5"h x 21.25"w at $700. I made them in May, 2006, and each one has different drawings of the same subjects, and a unique diary, all done with airpen and hand brush work. I don't have these in my 2006 Gallery, so if you're interested, I can send you images of the others. 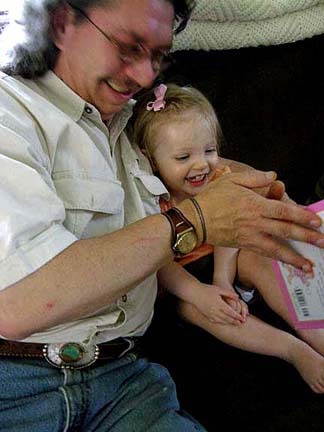 In May Jimmy taught Eva to slam a book shut without getting her thumbs caught in it. (He was supposed to be reading her the Potty Book, but he got sidetracked!) They had a lot of fun yelling "Snap!" each time they slammed the book shut, laughing as hard as they could. 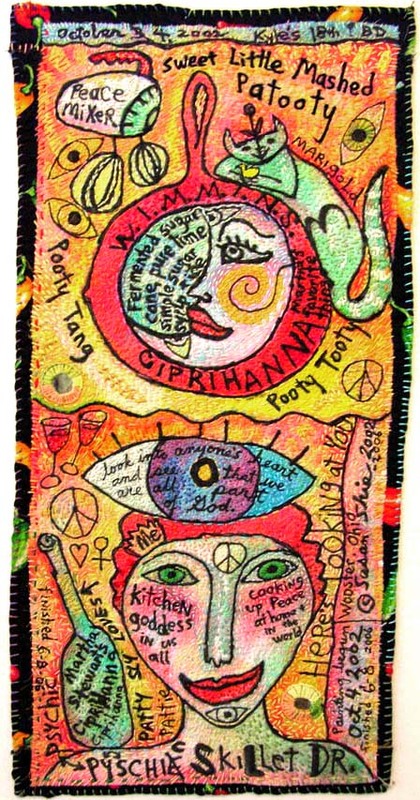 Above is my newly finished "Sweet Patooty" piece, begun in 2002, and finally all done, as of June 8, 2006. It's 20.5"h x 10"w, all hand stitched. 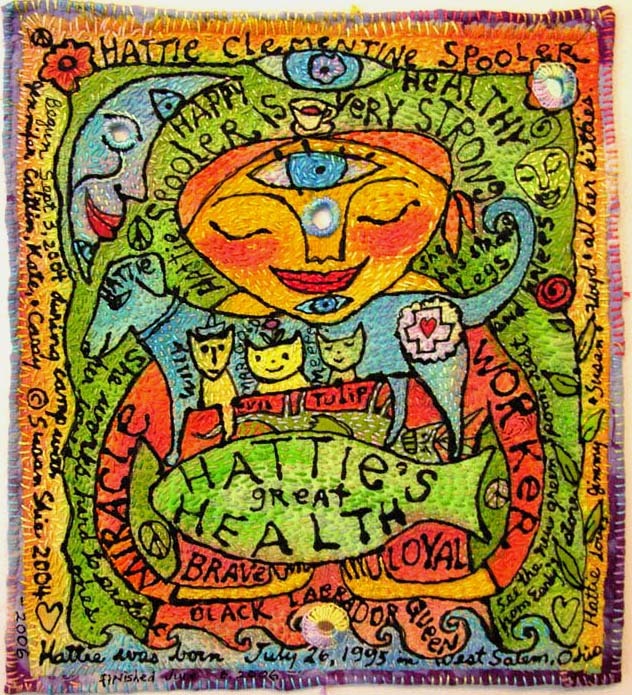 This piece, "Hattie Healing" was started in 2004, but I didn't get it done til this June. It's 11.5"h x 10.5"w. Like "Sweet Patooty" above, this one has tons of tiny hand stitching. Because my hands have been really messed up from all kinds of overuse, I'm hardly doing hand seewing right now. But I sure am glad to have these two pieces done! 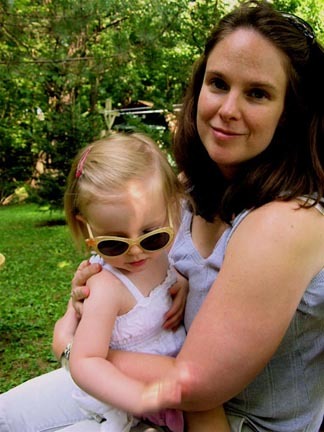 This is a nice, summery picture of my girls out in our back yard in July. Here are most of my QSDS students this June, in my five day class. 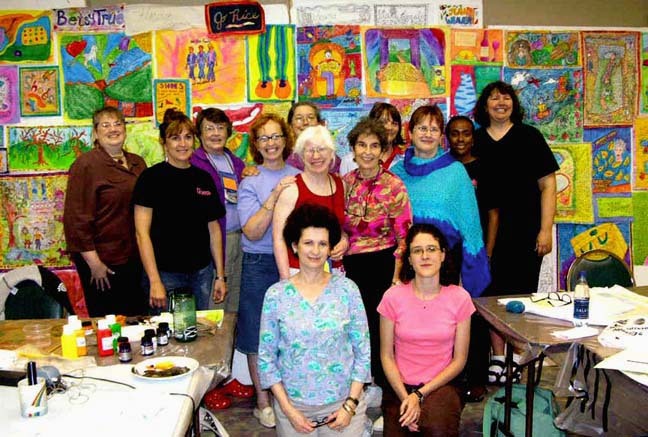 I taught two classes focusing on painting and writing on the work, with only some simple machine sewing, and this class worked on five topics, chosen by the group. We got to know each other really well, because each person talked about her own life, while explaining her paintings. Thesse students decided to sit back and direct, when it was time to put all the week's work on the wall together. 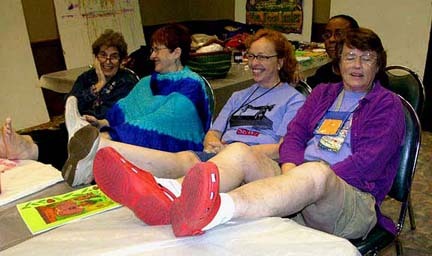 They look like the folks who sit out in the parking lot during a strike! 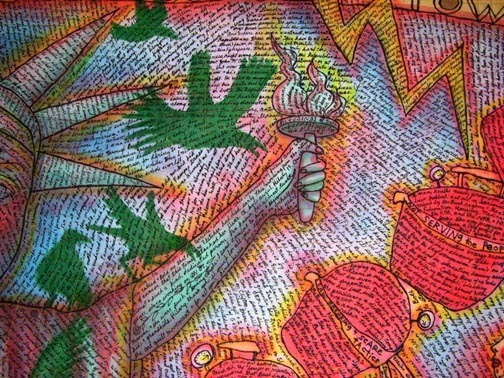 Above is a detail of my July, 2006 piece "The Power Out / Devil: Card # 15 in The Kitchen Tarot." It's 66"h x 69.5"w, and it's really about the big four day power out we had in late June, along with a lot of diary and social commentary, as usual. See the full view and a larger detail, as well as the full statement in my 2006 Gallery. Here's Eva, showing us where Floyd is, at the bottom of my July, 06 new piece "The Power Out / Devil." In mid July, our niece Aimee brought her two sisters, Jessica and Theresa, and her kids, Omari and Calise, to visit for a few days. Their stay included all of us going to the famous Snyder Ice Cream Supper at my cousin Carolyn's house, where we visited with lots of cousins and the elders. Aimee and her family live in Florida, so this visit was really special, as we don't get to see the kids very often. In the picture above, Jimmy's holding Omari, who's in first grade already, growing by leaps and bounds, and who loves to spend time in Jimmy's leather shop. Jimmy and he made a belt for Omari, which he's holding here. Here are four flasks Jimmy made in August for Mike Ruth. 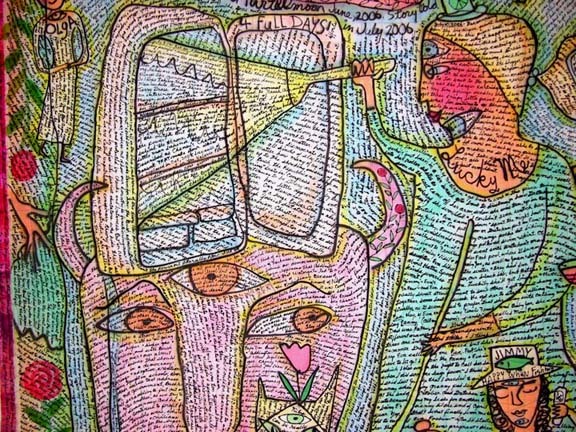 Visit Jimmy's site to see a lot more of his work. This is my newest large, studio piece, called "The Pressure Cooker / Tower: Card #16 in The Kitchen Tarot." It's 87" h x 64"w, and barely fits on my photo wall! You can read its whole statement and see a larger version of it and a bigger detail in my 2006 Gallery. Above is a detail shot of The Tower, in which you can see the crows sitting on the Statue of Liberty and some of the steamed up pressure cookers in the tower that's leaning so far to the Right that it's bound to fall over, or explode. Which will happen first? 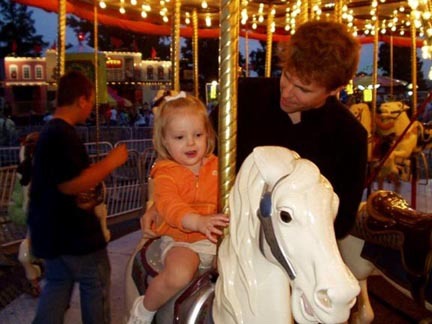 Here are Eva and Mike on the Merry-Go-Round, in between Gretchen and me on our horses. Jimmy took the pictures. Eva liked this ride a lot more than last year, when she was only ten months old and was just busy then trying to take it all in. After the Merry-Go-Round, Gretchen took Eva on the pony ride, where you ride a real pony, and it goes round and round in a circle with the other ponies. Eva's pony was the biggest one, and its name was Tulip! (Not to be confused with our cat Evil Tulip!) 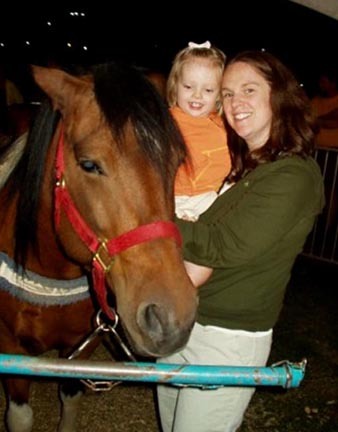 I took Gretchen on the pony rides every year at the Fair, when she was little, too. 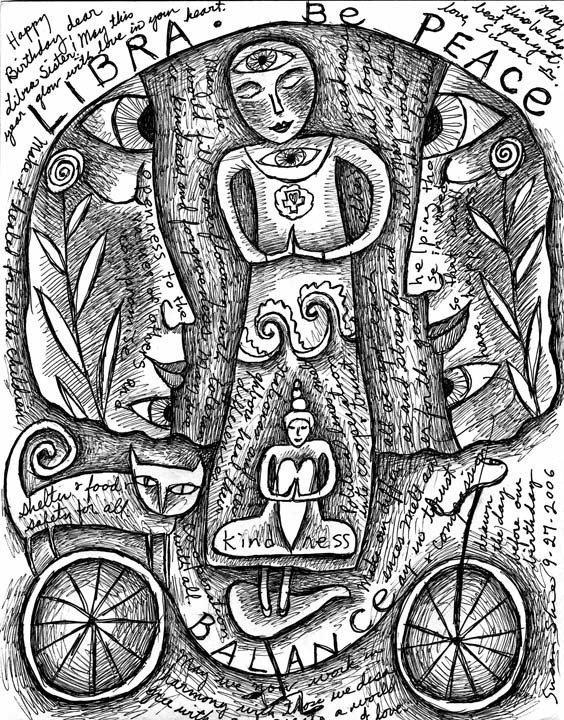 Above is my drawing for Art Quilt Tahoe's 2006 tee shirt. 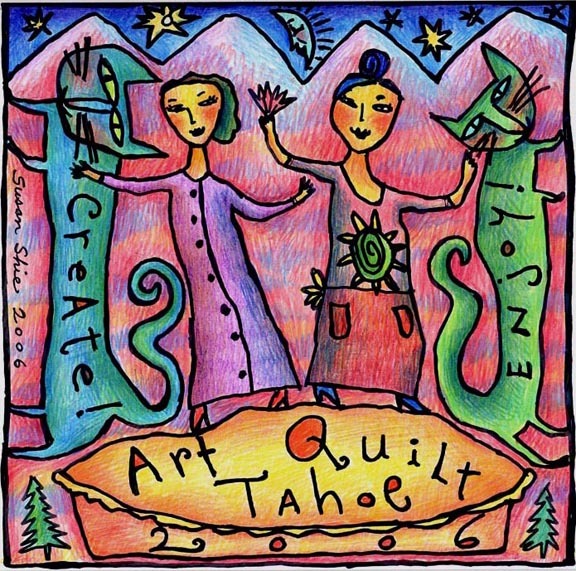 Check out Art Quilt Tahoe 2006 symposium. You can still sign up for my class! 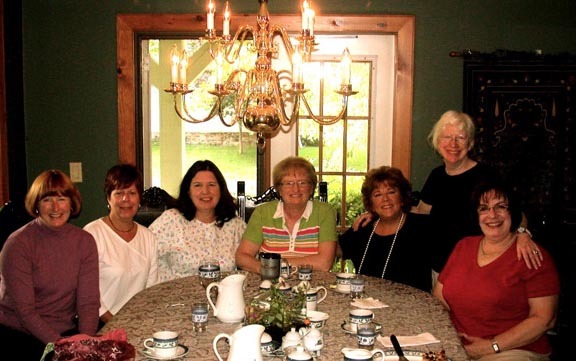 Here are all of us YaYas at the Weatherpine Bed and Breakfast in Niagra-on-the-Lake, on our big adventure for celebrating us all turning 55 (I turned 56 this month!) Five years ago YaYa Pat got us organized to go to Hilton Head for our 50th birthdays celebration, and that's when some of us met for the first time. We're all Pat's friends in one way or another, and now we're all each other's friends, too. This time Bev drove her incredibly wonderful RoadTrek RV, and all seven of us fit inside. Ah, now THAT was an adventure! Here are the large, center panels of all three of the last Cookbook Print Quilts for my project with Island Press of Washington University. These are #17, 18, and 19, but their technical numbers are PP#1, PP#2, and PP#3, standing for Printer's Proofs. Each of the three artists working on the project with me since 1999, actually making the quilts themselves since 2002, gets one of these three quilts. 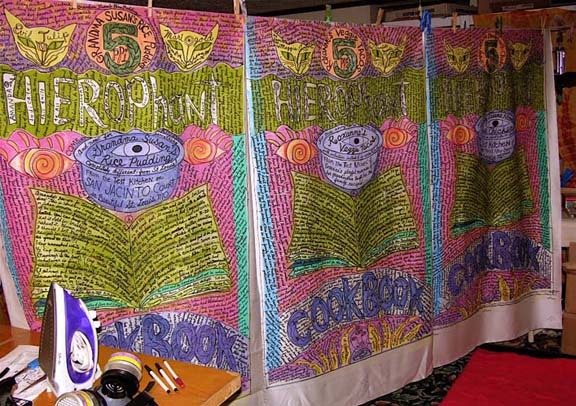 There are 11 panels for each quilt, these being the largest, center panels, and each artist gave me her own recipe and story about it, to add to my diary for her quilt. Thank you so, so much, Roxanne Phillips, Amanda Verbeck, and Jessie van der Laan, for being so steadfast through all this work, for doing all the sewing and beading on the print quilts. All the panels have the same print base throughout the edition of 19 quilts, but I've made a totally unique diary and drawings over each panel. 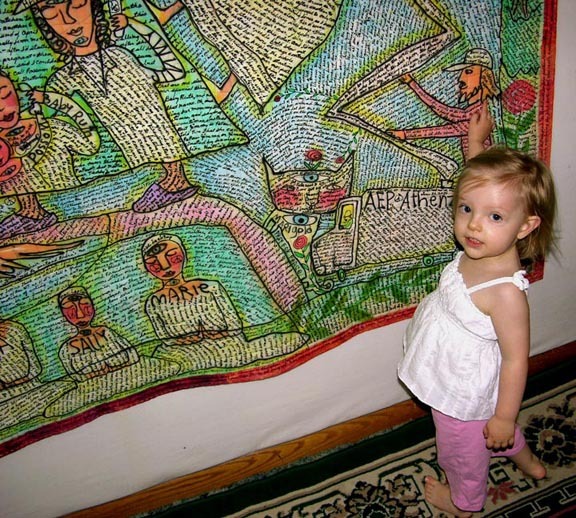 Each quilt has its own recipe and stories. So they look kinda alike from a distance, but up close, they have lots and lots of differences. I figure it'll take another year for these three last quilts to get done, and in the meantime, I'll be making my little xerox book of all 19 recipes. I hope someone will help us tour the quilts as a solo exhibition, and it would be really amazing and fine to have a real book about the project, not just a black and white xerox drawing book! So we'll have to see about all that. 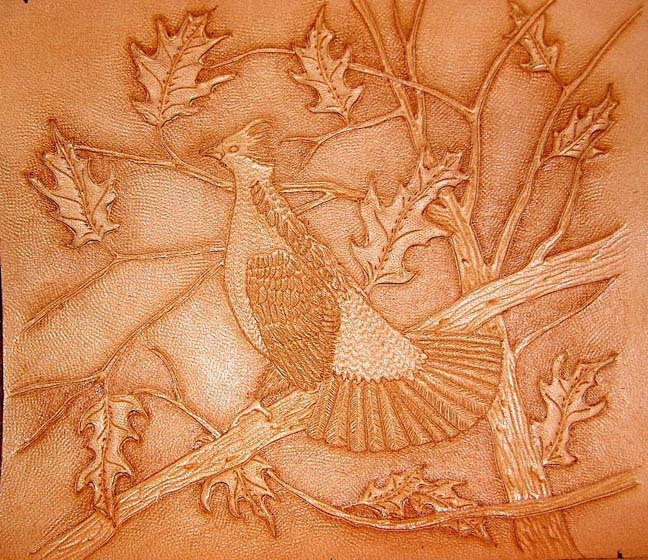 Above is the carved leather scene Jimmy's made for another flask, before he dyes the leather and paints the grouse. I thought it would be nice to show you how his stuff looks before he finishes it, because you can really see how all the details and textures are carved in by hand. I think this is harder to understand, once paint is over the images. This piece is about 6" square, and will be the front panel of a flask. Here's Eva getting ready to help me blow out the candles on my birthday cake, up at Gretchen and Mike and her house in Lakewood, on September 30, the Saturday two days after my real birthday. Gretchen made me a great spaghetti supper, complete with special bread from Breadsmith's. Eva, Mike, and Gretchen all drew my card, and Mike played great music on the piano. We enjoyed getting a preview of Eva in her leopard suit for Halloween and getting to hear her play harmonica for the first time! Above is my birthday drawing I made for this year, to send to my girlfriends who share my birthday. It's just a bic pen drawing on copier paper, and I drew it while listening to Profiles in Courage by John F Kennedy, on tape. That's one amazing book! I love my books on tape! OK, that's it. I hope to have another diary up by the end of January, so Happy Holidays! PS. 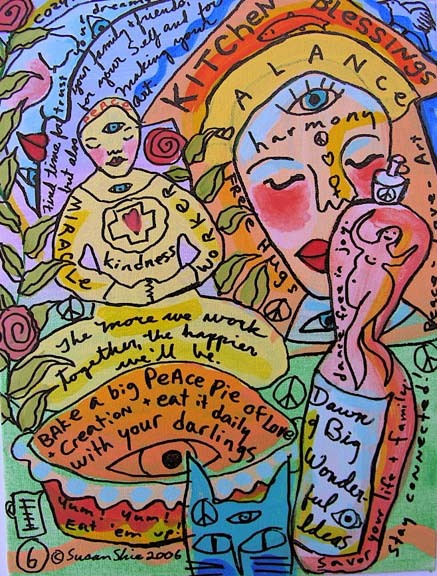 On October 6, I added a whole bunch of new Kitchen Blessings paintings to my 2006 Paintings Gallery, for sale. These are very affordable, and I hope they'll make good holiday gifts for you! Enjoy! Web site origianlly created by Susan Shie and Jan Cabral ©1997. Subsequent web site work © Susan Shie 1997 - 2006. 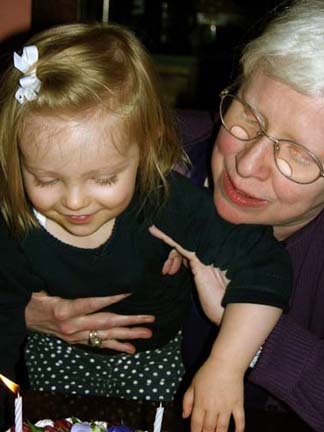 This page updated by Susan Shie, September 30, 2006. Web site hosting by Key to the Web, Ltd. ©2006.